Erect stalks with clusters of approximately 10 blue, purple, mauve, or pink flowers, to 30 cm high. 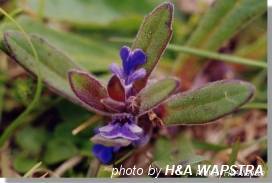 Spreading perennial herb with rosettes of soft hairy leaves up to 12 cm long. Occasional at lower altitudes in grassland and grassy heath in the eastern mountains. Usually grown from cuttings or by division, however seed germinates without treatment. Seed may need to be sown fresh. Propagate from cuttings or by division; will sucker vigorously.